As emerging technology continues to disrupt all aspects of business, the ability to find, assess, and engage specialist skills will drive organisational growth and their ability to innovate. To do this, businesses need to truly understand the preferences and motivators of in-demand talent, and align their recruitment and workforce processes accordingly. When it comes to Millennials, however, a mismatch often exists between what employers think they want, and what they’re actually looking for. Bridging this divide is vital. That’s why ManpowerGroup surveyed a number of senior HR professionals across the UK, to find out how ready they think Millennials are for the world of work, the development programmes they already have in place, and what they think the most effective way to engage Millennials is. 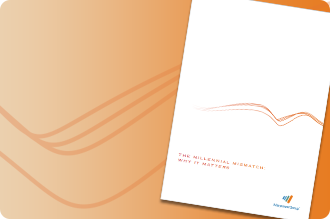 Our whitepaper summarises the key insights and compares the opinions of employers to those of Millennials themselves; to explore how different their opinions really are, and ways this divide can be bridged.